Your pet's procedure is very important and we will need to communicate with you about treatment options, prognosis and costs. It is most cost effective to treat other problems that are identified, while working with your pet during the same anesthesia period. We want to have the opportunity to discuss treatment options with you, and allow you to be a key decision maker in the optimal care of your pet. You will drop your pet off in the morning and we will need at least one contact telephone number (cell phones are wonderful, but they may not have excellent service in all areas), preferably two or more. Names and phone numbers for other family members can help in the event we are unable to reach you. In most cases your pet will be travelling home with you later in the day, or in the early evening. Please withold food at least eight hours prior to the scheduled appointment unless the appointment is for a guinea pig or rabbit. This is your best contribution to your pet's safety during anesthesia. To avoid dehydration please give your pet access to water until the morning of the appointment. Please discuss any medication your pet is taking with our staff when scheduling your appointment so they can give specific instructions regarding medication. 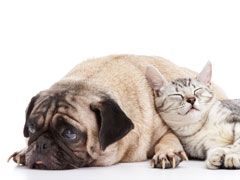 If your pet is on insulin, we will let you know whether to reduce or eliminate insulin prior to surgery based on your pet's individual situation. You should also be sure your pet gets normal exercise or a walk prior to the appointment, so they can eliminate urine or feces normally. To avoid injury to you and your pet, please have a leash or carrier for appropriate restraint when coming to the appointment.